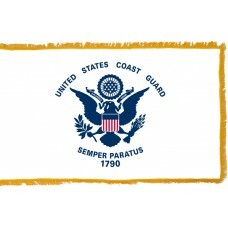 Shop for authentic United States Coast Guard Flags. 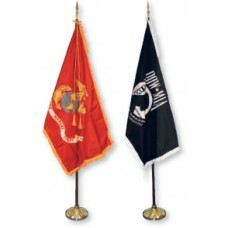 We offer indoor and outdoor Coast Guard flags in nylon and polyester. Our outdoor flags are finished with a canvas heading, while indoor flags are finished with a lined pole hem and your choice of with or without fringe. 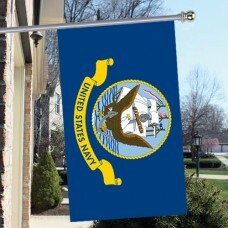 We also offer indoor and outdoor Coast Guard flag sets. The United States Coast Guard Flag features a white field with a dark blue United States Great Seal in the center. The Great Seal features an eagle with its wings spread open and shield on its chest. The shield has thirteen alternate red and white stripes which represent the original thirteen colonies. The eagle is carrying thirteen arrows in its left claw and in its right claw, it is carrying an olive branch which represents that the United States has "a strong desire for peace but will always be ready for war." The eagle's head is turned towards the olive branch which shows that the country wants peace above everything else. In its beak, the eagle is holding a scroll which writes the country's motto, "E Pluribus Anum," which translates as "Out of many, one." There is a "glory" above the eagle's head with thirteen stars (again, representing the thirteen colonies) and above that, "United States Coast Guard" is written. 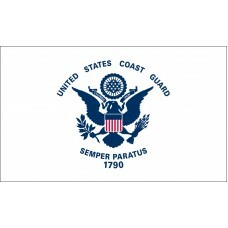 Below the eagle "Semper Paratus" is written, which is the Coast Guard motto and translates as "always ready". Below that "1970" is written which is the year that the Revenue Cutter service was formed which is where the United States Coast Guard originates from. The colors used on the flag are the same colors as the flag of the United States of America and white represents innocence and purity, the color red represents bravery and hardiness, and the blue represents perseverance. The United States Coast Guard flag was adopted on January 28th, 1964. The United States Coast Guard was established to "protect people, environment, industry, and security of the United States of America on seas, lakes and rivers." It is the oldest sea service of the United States as well as the smallest branch of the military. The United States Coast Guard uses boats, ships, and airplanes to prevent crimes, such as smuggling and to rescue boats and ships. In 1790, the Revenue Cutter Service was established following George Washington signing an act which would allow for 10 boats (which were also known as cutters) to be built with the intention of collecting custom duties and taxes and to ensure that shipments to different countries were getting through. In 1791, the first cutter (known as "The Vigilant) was launched. In 1915, an "Act to create Coast Guard" was signed by President Woodrow Wilson and the United States Coast Guard was formed following the merge of the Revenue Cutter Service with the United States life-saving services. The United States Coast Guard Flag is not used as a military flag but is used as a symbol of law enforcement and the use of the flag also allows captains of other ships to recognize the vessels. It is flown at Coast Guard services and sometimes used during parades and ceremonies.